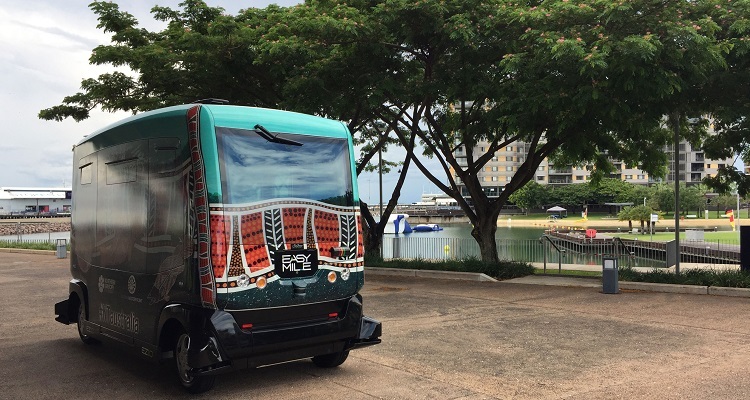 On 15 February this year the EZ10 driverless shuttle has began transporting passengers between Indo Pacific Marine and Stokes Hill Wharf daily, at Darwin Waterfront, Australia. The NT Government has taken a monumental step in establishing Darwin as Australia’s first fully operational transportation trial site for an autonomous passenger vehicle. “Autonomous transport technology is no longer science fiction – it’s here and we are leading the way,” Mr Gunner said. “With this project, the NT Government and Darwin join an exclusive list of jurisdictions worldwide actively developing autonomous transport including Singapore, Dubai/UAE, France, Netherlands, California and Japan. The fully autonomous vehicle provides zero emissions when operating, is fully air-conditioned and capable of carrying up to 12 passengers at one time. The vehicle can provide up to 12 hours of operation per charge. “The EZ10 vehicle attracted international and domestic notoriety during the Intelligent Transport System World Congress and there is now a dozen International and Australian clients actively seeking vehicles from EasyMile including universities, airports, precincts and shopping centres,” Mr Gunner said.